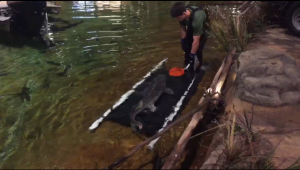 Fish Training (White Sturgeon) – With Johnny May. In this podcast we are introduced to one of Animal Training Academies’ members Johnny May and we discuss fish training (target training a white sturgeon). White sturgeon are a large species of fish that can grow up to 20 feet or 6 meters in length. What I really like about this week’s training tidbit is that is that is provides a nice example of the universality of the application of positive reinforcement animal training. All animals are constantly moving towards the things they want and away from the things they don’t. White sturgeon and other fish species are no different. If we pair their desirable behavior with positive reinforcement – then as with all animals – fish will learn to repeat those behaviors in the future. As Johnny describes well in this podcast episode the techniques he used to train his white sturgeon are the same techniques that we use at home with our pets, or with our zoo animals. 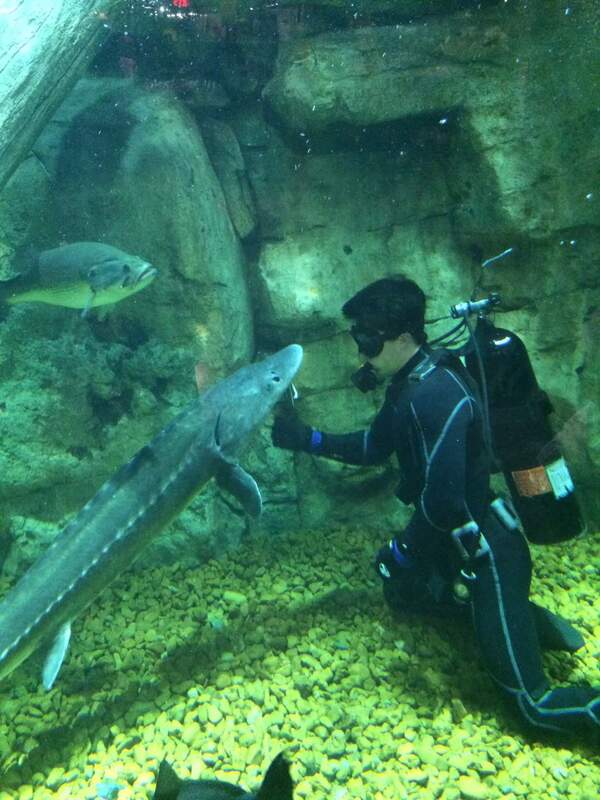 Johnny facilitated the white sturgeons learning by using successive approximations or baby steps. He then trained the animal to voluntarily swim over a Stretcher. He utilized target training to achieve this (See video below). This is obviously good for the animal welfare, empowering for Johnny and his team, beneficial for the aquarium and great for visitor engagement. Well done Johnny! FISH TRAINING – JOHNNY MAY. Johnny began his career working at his local zoo in 2008 as a seasonal keeper. From there he worked, interned, and volunteered at a number of zoos, sanctuaries, veterinary clinics, aquariums, and wildlife rehabilitation centers. In 2013 he graduated for Mississippi State University with a degree in Animal and Dairy Science with a concentration in Veterinary Science. 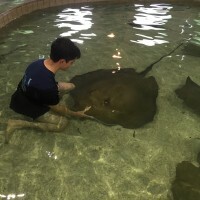 He is currently working towards the completion of a Master of Business Administration at the University of Memphis and has recently accepted a position at a public aquarium currently under construction in the United States. During his time at one of the zoo hospitals he was volunteering at, he witnessed the benefits of training animals to voluntarily participate in their own routine health exams. It was these experiences that inspired him to attempt training what some might consider non-traditional species. What an awesome achievement Johnny! Such an inspiration for this industry..Also, a massive Happy-1st-Animal Training Academy-Birthday, Ryan!! Thank you for sharing these audio gifts every week! I really enjoyed this podcast and the videos. It sounds like Johnny is a natural trainer who improved his natural abilities by studying behavior and taking advantage of multiple learning resources. Great successes with the giraffe and white sturgeons. Veterinarians love people who train animals to participate in their own health care. It gives them care an treatment options they may not have otherwise. One of the important points this podcast makes me think of is the additional benefit some people don’t think about. When an animal is in need of medical care if they are so sick or injured that they don’t participate voluntarily there is still a huge benefit from the training time you put in. That benefit is the reduction or elimination of stress during the procedure. 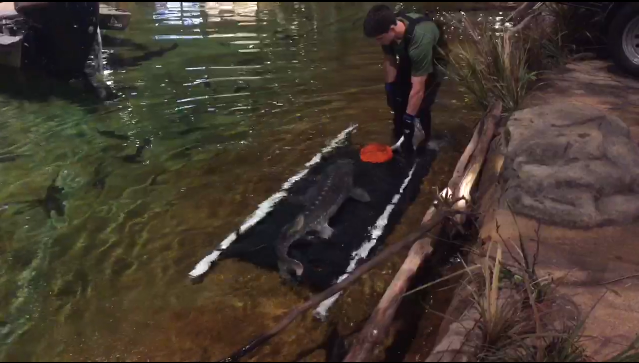 For example if you did not train the sturgeon and you needed to stretcher it the stress level and negative behavior would be much higher. Because it is trained and has been desensitized to it the experience will not have such a negative impact on the animal. Thanks to both of you for sharing this training. Wery interesting to hear about your training. Fish are so fun to train. I have trained koi carp -just for fun + some other aquarium fish. In the winter when the weather is bad it is fun to train trick with fish as a change from the other animals (mostly dogs). I tried one year to train a crayfish to -but I had to give it up when I could not really get it to give me any behavior at all. Thank you so much for your message, it’s great to hear from you. Do you film any of your training? Very interesting with the crayfish… I would love to find someone who has had success in this area, it would be fascinating to learn about their expereince. I only have photograph of fish training, no video. PT. I have cechlider. For the winter I will try to find one of them as a training partner. If you find one that has experience with crayfish, I would very much like to hear about it. I have also tried with Xenopus laevis. There are two big problems with training them. The sightis wery poor (a lot is almost blind) + they have a very bad memory. But I learned the one to swim through a ring. For every day it is dogs I train (I have a dog school) and my own dogs challenge is a lot of concept training which I find really exciting. I am always open to new challenges, so if you get an idea for the long winter evenings, so just come with them. Ore a new animal I might “try”. ps. for fish I use light flash as marker for right behavior.